Belleza Mia creates beautiful jewelry. One of my favorite pieces is this leaf necklace. You will definitely want to check out Belleza Mia!!! Enter the Pocket Full of Posies giveaway for a meal planning system. (And take advantage of the 20% discount). You will be glad you did. Go HERE. Mad In Crafts is always knocking-off Pottery Barn. And she does it so easily, inexpensively and beautifully. 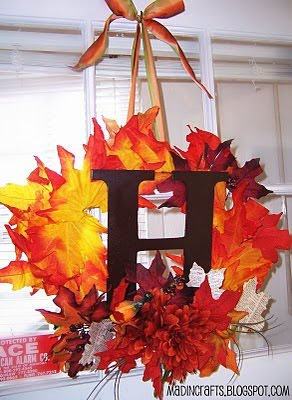 This fall wreath with book page leaves is gorgeous. Read about the book page leaves. Blog Tip(s) For The Week! This weeks blog tip from ME!!! I know, CRAZY!!! Let's talk about a blog roll! Do you like the thumbnail pictures that you see on other blogger's blog roll? Look to the side of my blog. There are usually five unless you click on "Show All." To get the thumbnail of your favorite bloggers last projects is simple. Click on "Design." Then click on your "My Blog List." (If you don't have a blog list, then click on "add a gadget" and select "Blog list" and start adding blogs you enjoy by entering the blog address after you click on "Add to List".) I like "Sort: Most recently updated." My list was getting so long that I clicked on "Show: 5 blogs." You can show more if you want. Then I click on all the boxes below that except for "snippets of most recent." I just want the title of the post. Remember to save! Now view your sidebar and look at that beautiful blog roll! I hope you add Someday Crafts to your blog roll! Show off the projects you've made from dollar store products! The link will be open all week. Come back on Friday to see everyone's creativity. looking forward to the dollar store link up! you know I love me some dollar tree! Thanks for hosting. Hope you're having a great week. I love a good PB knock-off! That looks great! Thanks for hosting!! Fantastic blog tip! Thanks much! Thanks for hosting. And for the great Blog list tutorial. I am a farely new blogger and can use any advise I can get. I am also a new follower, Yay! Keep up the great work. OH NO!!! I have these ADORABLE $store pictures I made for my daughters room but the post isn't ready AND I'm leaving for a mini vacation tomorrow morning!! Thanks for hosting. Looking forward to coffee and a bunch of links and crafts!